THE Detail can reveal that 69 children living in care went missing for more than 24 hours on 132 occasions in the last year. This is the highest number recorded over the last three years. The latest figures we requested from the Health and Social Care Board (HSCB) come as it was announced last week that a landmark report into the sexual exploitation and abuse of young people in Northern Ireland would publish its findings in the autumn. The report was commissioned last year after police reviewed a series of cases involving children going missing from the care system in Northern Ireland. In September 2013 it emerged that the police had identified a group of 22 young people aged between 13 and 18 that may have been abused. Of the 22 cases, 18 involved children in the care system recorded as missing a total of 437 times. The figures we are reporting on today are collected as part of the HSCB’s ‘untoward event’ reporting mechanisms. In Northern Ireland, health and social care trusts are required to inform the HSCB within 72 hours of any “untoward events” involving children in care. Other events that are recorded include the number of times children in care have been detained by the PSNI for more than four hours or sent to the Juvenile Justice Centre (JJC). A separate article published by The Detail today highlights new figures on admissions to the JJC contained in an internal presentation hosted by Stormont’s Justice and Health departments. The findings show that the number of times children living in care were placed in Northern Ireland’s Juvenile Justice Centre in Bangor more than doubled from 2011 to 2013. In a statement to The Detail a spokesperson from the Health and Social Care Board said: “There are approximately 3,000 Looked After Children (children in care) in Northern Ireland. The percentage who go missing for more than 24 hours or who are remanded to Woodlands remains low. “A number of young people within the care system have patterns of behaviour such as antisocial behaviour, drug/alcohol use, going missing from their home that are well established by the time they enter care. Often these behaviours are the reason for the young person to be brought into the care system. At the end of last year the Health Minister, Edwin Poots, announced the inquiry into allegations of sexual abuse of children living in and outside of care here. The former commissioner for children in Scotland, Professor Kathleen Marshall, was appointed as chair of the inquiry and it is expected that she will publish her findings by November this year. The purpose of this inquiry is to examine the nature of child sexual exploitation in Northern Ireland and measure the extent to which it occurs. A further report by the Safeguarding Board for Northern Ireland (SBNI) is due to be published in March 2015 and will look specifically at the circumstances in which 22 young people aged between 13 and 18 may have been abused. The latest figures reported on by The Detail today come as it emerged in England last week that at least 1,400 children were sexually exploited from 1997-2013 in Rotherham. Paula Rodgers is policy co-ordinator for Include Youth, an organisation which promote the rights and best interests of disadvantaged young people in Northern Ireland. She said the missing children figures for Northern Ireland are a timely reminder of the vulnerability of children in the care system. She said: "The figures are particularly worrying because there is the ongoing Child Sexual Exploitation (CSE) inquiry which is due to report its findings later this year. 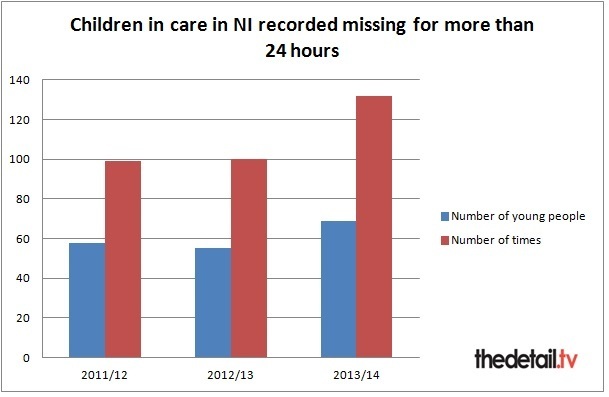 We would be very mindful of the need to continue to look at the untoward event figures which highlight an increase in the number of times looked after children have went missing for more than 24 hours. A spokesperson for the HSCB added it is extremely rare for children from care to be away from their placement in situations where staff do not have a good idea as to their likely whereabouts, have some form of mobile phone contact or some information as to the young person’s activities.